Quick, Convenient and Hands-Free; the MagicMount is a new magnetic mounting system for conveniently mounting your smartphone and devices to the dashboard or windshield in your car, truck, boat or RV. Lock your smart device in place with the Scosche StickGrip suction dash mount featuring a 4-Axis adjustable angle with lock for optimal viewing from any seat. The integrated cable clip lets you neatly connect your cables to the back of the mount keeping cables out of the way. Its cradle-free design eliminates the need to tighten around your device, just hover your device near the magnetic surface and it instantly locks securely in place. These powerful N35 neodymium magnets hold your phone and device securely in place even on the bumpiest roads and are 100% safe for all modern smart phones and devices. 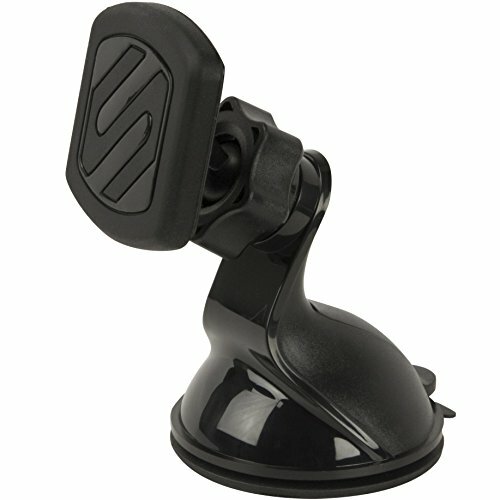 The low profile mount safely attaches to your dashboard using the StickGrip suction cup base and can adhere to your windshield, windows, kitchen countertops and many other non-porous surfaces. The easy install and dismantling allows you to take it anywhere you need your phone and mount most. VERSATILE: Safely and quickly secure a mobile device to a wide variety of car, home or office surfaces. SECURE: StickGrip material on suction cup base provides a strong, secure hold on dash's, windows, countertops, desks, tables and other surfaces. STRONG MAGNETS: Extra powerful Rare-Earth neodymium magnets provide a secure grip to your devices and are 100% mobile device safe. OPTIMAL VIEWING ANGLE: 4-Axis, 360 Degree adjustable head with enhanced soft touch rubber lock-nut for secure positioning and optimal viewing from almost any angle. CONVENIENT: Integrated cable clip secures the charging cable to the mount and the open, cradle-free design permits safe, easy one-handed device use and access to all controls and ports. WIRELESS COMPATIBLE: With the proper plate placement magnets will not interfere with Qi Wireless Charging Phones. IT'S THE LAW: Many states have a law requiring the drivers phones be mounted in the vehicle while in use. Our mounts securely hold your phone for easy one handed or hands-free operation. Check your local laws.